NICE DIGS: The Fuso Fighter cab is an excellent workplace. Two Fighters on flats, who wins? 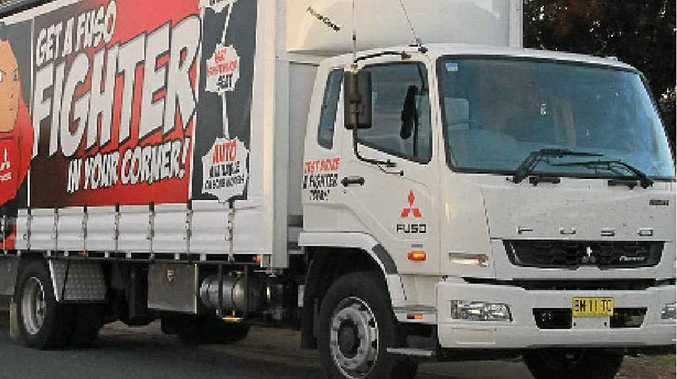 FUSO has a tradition of supporting rural field days and this year has a road train of seven current models packaged into three rigs on the road. One is the FV prime mover I drove recently, the other two are Fighters, a 10-tonne GVM 1024 tray-top with one Fuso on the back and another on a trailer, and a 16-tonne GVM 1627 curtainsider towing a trailer with two of its little brothers on the back. The difference between 240hp and 270hp was enhanced by an Allison auto transmission in the bigger unit, which proved to be significant in keeping up momentum on the long flats of the Riverina. Both trucks share Fuso's new 7.5-litre single OHC six-cylinder diesel engine with an SCR emissions system that requires AdBlue additive to keep exhaust gasses to the latest standard of clean and green. Fuel injection mods and engine management software tweaks provide the extra 30hp and 39Nm of torque in the 1627. Neither of the trucks were at maximum GCM, but the chunky, long loads made a mess of the aerodynamics, meaning it took a while to get up to cruising speed against gusty crosswinds. Apart from the trucks riding piggy-back, the 1627 had a van body full of marketing and display junk, all ready for assembly at Griffith's annual field day. The run from Hay to Griffith is dead flat, with the almost unbroken vista of low scrub stretching out ahead, rolling away to the horizon out the side windows and slowly disappearing in the mirrors. It was a good test of the staying power of these mid-range models. And that's where the Allison version shone. But my first stint was in the lighter unit, which has a six- speed Fuso built all-synchro gearbox as standard. The wide spread of ratios was needed with the full load, and I could do little as I watched the other two trucks gradually roll away into the distance. The 1024 is really a metro delivery truck and was a perfect set-up for that. But even on the open road, when it got up to cruising speed there was no real problem in staying ahead of slower traffic. The Fuso Fighter cab is an excellent workplace. The seat is quite thin but has a good profile so I felt comfortable for the whole drive. Vision is excellent, as the driver sits well forward and the screen is very deep. After grinding my way up to maximum cruising speed the cruise control helped the kilometres melt away. We stopped halfway and I switched to the 1627 model with the van body and a tri-axle trailer with two trucks on the back. As it was a higher-profile rig it really needed the additional torque. But matching this Fighter engine to an Allison fully automatic transmission made the big difference. Once you are under way with an Allison, the torque converter takes all the harshness out of the change but locks up just after a gear is engaged to eliminate any power loss. Acceleration was seamless on the few hills we encountered and the ease of operation in and around Griffith convinced me that an auto in this weight bracket is a pretty smart move, even if it does cost a few more dollars up front. I've found that all Fusos have a brawny front end so they're always more comfortable when fully laden. These two medium-duty models are a good combination of strength and low tare weight, so operators can be confident the Fighter will be a high-productivity truck.